Goldfinch youngster, originally uploaded by Laura Whitehead. 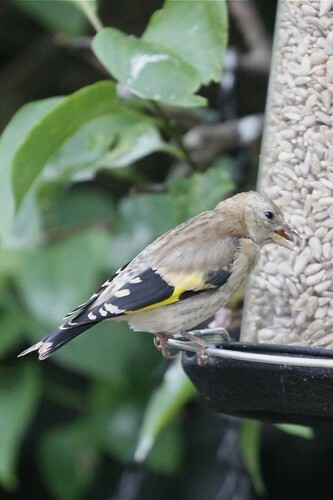 First of the goldfinch youngsters out and about today. Wonderful blog! I’ve just started a blog for photos of our bird visitors — we live in North Oxfordshire — and I will link yours. Your photos are really fantastic. In this blog we'll describe the day to day comings and goings of the birds in our Devon garden. Tony is a naturalist and environmental artist. Laura is a free range creative web and print designer. We've recently moved from the village of Ipplepen to the town of Newton Abbot with our two children Ralph and Oli, our dog Henry, and numerous cats (none of whom would ever dream of eating birds).